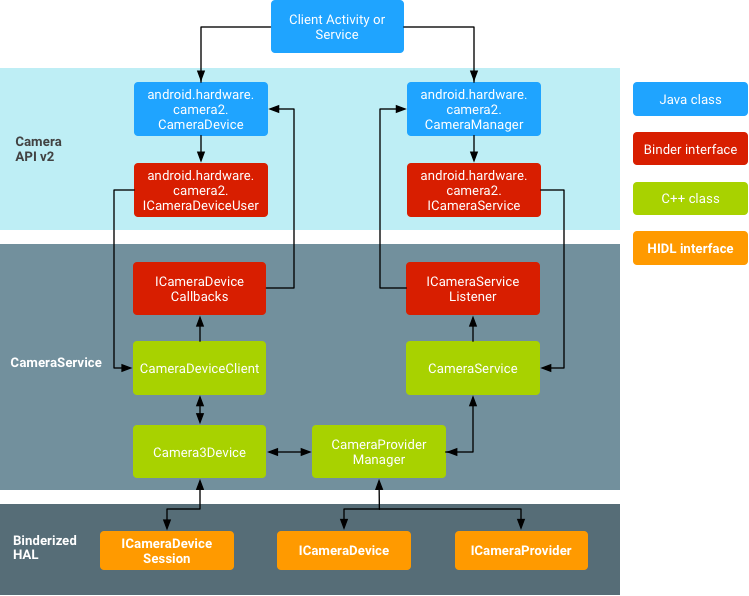 Android's camera Hardware Abstraction Layer (HAL) connects the higher level camera framework APIs in Camera 2 to your underlying camera driver and hardware. 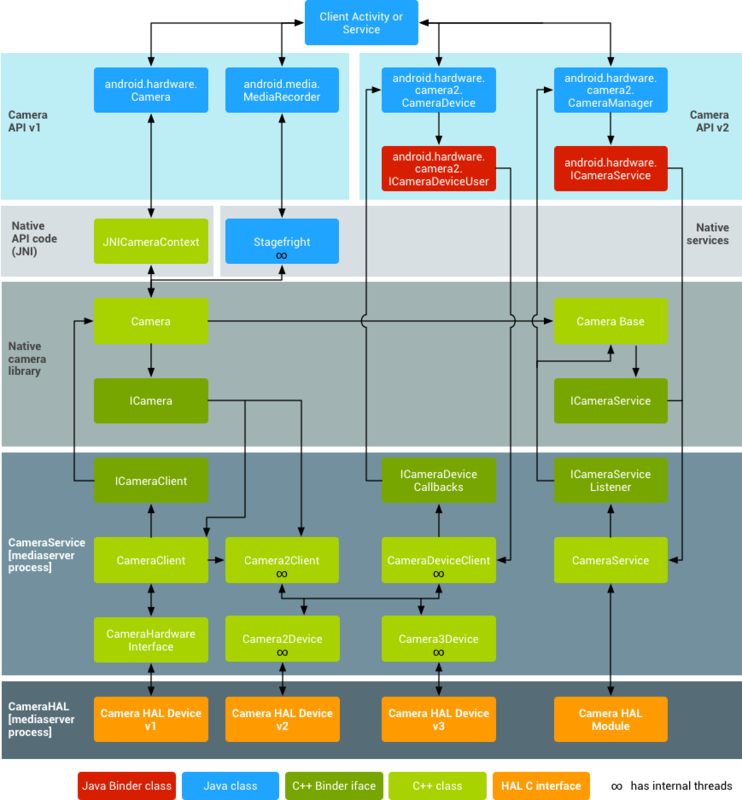 The camera subsystem includes implementations for camera pipeline components while the camera HAL provides interfaces for use in implementing your version of these components. Note: If you are implementing the Camera HAL on Android 8.0 and higher, you must use the HIDL interface. For information on the legacy components, see Legacy HAL components. At the application framework level is the app's code, which uses the Camera 2 API to interact with the camera hardware. Internally, this code calls corresponding Binder interfaces to access the native code that interacts with the camera. The binder interface associated with CameraService can be found at frameworks/av/camera/aidl/android/hardware. The generated code calls the lower level native code to obtain access to the physical camera and returns data that is used to create the CameraDevice and eventually CameraCaptureSession objects at the framework level. This framework residing in frameworks/av/ provides a native equivalent to the CameraDevice and CameraCaptureSession classes. See also, NDK camera2 reference. The IPC binder interface facilitates communication over process boundaries. There are several camera binder classes located in the frameworks/av/camera/camera/aidl/android/hardware directory that call into camera service. ICameraService is the interface to the camera service; ICameraDeviceUser is the interface to a specific opened camera device; and ICameraServiceListener and ICameraDeviceCallbacks are the respective CameraService and CameraDevice callbacks to the application framework. The camera service, located in frameworks/av/services/camera/libcameraservice/CameraService.cpp, is the actual code that interacts with the HAL. The hardware abstraction layer defines the standard interface that the camera service calls into and that you must implement to have your camera hardware function correctly. The HAL sits between the camera driver and the higher level Android framework and defines an interface you must implement so apps can correctly operate the camera hardware. From Android 8.0, the Camera HAL interface is part of Project Treble and the corresponding HIDL interfaces are defined in hardware/interfaces/camera. ICameraProvider: For enumerating individual devices and managing their status. ICameraDevice: The camera device interface. ICameraDeviceSession: The active camera device session interface. Reference HIDL implementations are available for CameraProvider.cpp, CameraDevice.cpp and CameraDeviceSession.cpp. The implementation wraps old HALs that still use the legacy API. Starting with Android 8.0, Camera HAL implementations must use the HIDL API; use of the legacy interface is not supported. For more information on Treble and HAL development, see Treble Resources. This section describes the architecture of the legacy HAL components and how to implement the HAL. Camera HAL implementations on Android 8.0 and higher must use the HIDL API instead, described above. At the application framework level is the app's code, which utilizes the android.hardware.Camera API to interact with the camera hardware. Internally, this code calls a corresponding JNI glue class to access the native code that interacts with the camera. The JNI code associated with android.hardware.Camera is located in frameworks/base/core/jni/android_hardware_Camera.cpp. This code calls the lower level native code to obtain access to the physical camera and returns data that is used to create the android.hardware.Camera object at the framework level. The native framework defined in frameworks/av/camera/Camera.cpp provides a native equivalent to the android.hardware.Camera class. This class calls the IPC binder proxies to obtain access to the camera service. The IPC binder proxies facilitate communication over process boundaries. There are three camera binder classes that are located in frameworks/av/camera directory that calls into camera service. ICameraService is the interface to the camera service, ICamera is the interface to a specific opened camera device, and ICameraClient is the device's interface back to the application framework. The camera's driver interacts with the actual camera hardware and your implementation of the HAL. The camera and driver must support YV12 and NV21 image formats to provide support for previewing the camera image on the display and video recording. The HAL sits between the camera driver and the higher level Android framework and defines an interface you must implement so apps can correctly operate the camera hardware. The HAL interface is defined in the hardware/libhardware/include/hardware/camera.h and hardware/libhardware/include/hardware/camera_common.h header files. camera_common.h defines camera_module, a standard structure to obtain general information about the camera, such as the camera ID and properties common to all cameras (i.e., whether it is a front- or back-facing camera). camera.h contains code that corresponds to android.hardware.Camera. This header file declares a camera_device struct that in turn contains a camera_device_ops struct with pointers to functions that implement the HAL interface. For documentation on the camera parameters developers can set, refer to frameworks/av/include/camera/CameraParameters.h. These parameters are set with the function pointed to by int (*set_parameters)(struct camera_device *, const char *parms) in the HAL. For an example of a HAL implementation, refer to the implementation for the Galaxy Nexus HAL in hardware/ti/omap4xxx/camera. Create a device/<company_name>/<device_name>/camera directory to contain your library's source files. Your library must be named camera.<device_name> (.so is appended automatically), so Android can correctly load the library. For an example, see the Makefile for the Galaxy Nexus camera located in hardware/ti/omap4xxx/Android.mk. For an example of a device Makefile, see device/samsung/tuna/device.mk. Declare your camera’s media codec, format, and resolution capabilities in device/<company_name>/<device_name>/media_profiles.xml and device/<company_name>/<device_name>/media_codecs.xml XML files. For details, see Exposing codecs to the framework.